Always fantastic, very nice people. Good oil change and a clean car after! 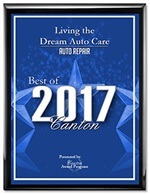 Living the Dream Auto Care was great to work with from start to finish. Got my car in quickly, fixed everything up in a timely manner and offered a great value on their device. Everyone I dealt with was friendly, knowledgeable and helpful. Will definitely use Living a Dream Auto Care again in the future. Fantastic service, great waiting area - there's a couple of nooks for computer station work - free coffee. The staff was professional and attentive with a handy written inspection report. They also wash and vacuum out your car when they're done! Very professional auto repair shop! Was recommended highly by my sister and my own experience confirmed her testimony! Once again the gang at LTD came thru. My daughter had an issue with her car and Herb, Chris and the rest of the staff took care of it ASAP. Amazing business,amazing staff!!!!! Paul, your a lucky guy to have such great people who give great service! You could not work with a more honest facility....Try them and you will be a satisfied customer !! Nice employees offering great service. Never disappointed. They are true professionals in the auto care business. Couldn’t feel more comfortable and at home with them caring for my automobiles.